White paper on crime 2004 Part1/Chapter1/Section8/1. Fig. 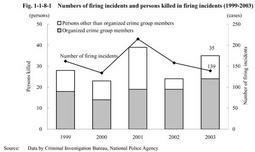 1-1-8-1 shows the numbers of firing incidents and persons killed in firing incidents over the last five years(firearms include handguns,rifles,machine guns,cannons,and shotguns as well as other loaders and air guns with the function of projecting metal bullets;hereinafter the same).In2003,firing incidents decreased from158in2002to139,while persons killed increased from24in2002to35,as firing incidents killing many persons occurred.Among35persons killed,24persons were organized crime group members(regular members and quasi-members;hereinafter the same in this section),and11persons were not those members,both of which increased from2002. Fig. 1-1-8-2 shows the number of cleared firearm offenses and cleared cases involving the use of firearms over the last five years,comparing the cases committed by organized crime group members to other cases. In2003,cleared firearm offenses decreased from123in2002to113,of which69cases(61.1%)were committed by organized crime group members.Of firearms used,handguns were the most common at71,accounting for about62.8%of the total. Fig. 1-1-8-3 shows the number of handguns seized from organized crime group members and others over the last five years.In2003,seized handguns increased from747in2002to785,among which real handguns were644or82.0%.In2003,seized handguns from persons other than organized crime group members(451)were more than those seized from group members(334),as same as in2002. When foreign countries where guns were produced are examined,among the644real handguns seized in2003,U.S.A.has the largest share with189,followed by Philippines with56,China with50,Italy with40,Russia with39,and Germany with32(Source:Data by Criminal Investigation Bureau,National Police Agency).